After leaving the aftermath of the Tour I went in search of food. 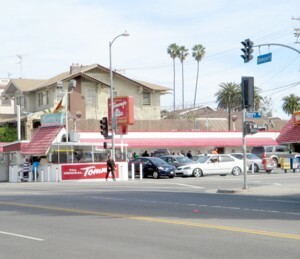 I rode my bike on an uphill journey, northwest of Downtown, to the fabled corner of Beverly and Rampart. It is there that, for over 60 years Burgers, Hot Dogs, and French Fries, have intermingled, in orgasmic nirvana, with the most divine Chili ever made. So special that to sit down to eat would be blasphemy! I had only 1 place in mind, diet be damned! I hadn't been to this location in years! I was in line when 5 teens ( 4 girls, and a guy, all about 16. ) got in line behind me. One of the girls said she was just gonna order the meat patty. "Just the meat! Just the meat? What the heck is you thinkin' woman? You DON'T come to Tommy's just for the MEAT! I'll have you know I came all the way from Santana, and I didn't come just for the meat!" "Hey! Talk to this young lady, will you, man? She only wants to order the MEAT!! Please explain to her the error of her ways!" Anyway, it turned out to be the happiest moment of their stop at Tommy's. They came over to my spot along the wall of stand up counters, where I had been chatting with a nice older Hispanic man and his wife, about the Tour, and set their orders on the counter. Next thing I know one of the gals is upset as the guy gets in the car, and leaves them all standing there. I guess one of the Girls called her Mother for a ride, and then that mother called another Mother, and this led the girls to try to co-ordinate the story of why they had been out ALL NIGHT. Something about ending up sleeping together at a hotel, led them to try to pinpoint a suitable hotel in the area, whose name, and location, they could be vague about. I heard comments about Mom's going to be "pissed", and "I'm going to be SOOO screwed!" Suddenly a car pulls up, and The Wrath of God, in the form of a fiery, tiny, Mexican Mama, probably about 35, gets out. "Never again!" Never again, Mijo! You will NEVER go out with them again!! Get in the car, now!!" 2 of the girls got in, leaving the other 2 stunned, and depressed, where they stood. They were silent for another 10 minutes, then a van pulls up with a couple of other women, including 1, about 50 or so, who had obviously been crying, and the girls got in. All the food had been long forgotten, and left behind. During this who drama, I, on one side, and my 2 new acquaintances, on the other, could only watch. "Man, that was one furious Mama! If South Central, and East LA, had more like her, that inner city would be cleaned up in a hurry!" The gentleman smiled at that, and made the point that the guy in the group was trouble, and the young must learn from their mistakes. He agreed with my observation that the Mama obviously looked like she had once made the same mistakes, and was trying to keep her daughter from doing the same. After this bit of excitement I head out for Hollywood, on the Metro Red Line Train, to ride down Hollywood Blvd., from Vine west to Graumann's Chinese Theatre, and the Kodak Theatre, near Highland. Along the few blocks around this intersection of entertainment venues can be found some enterprising men, and women, dressed to appear as famous characters in film. 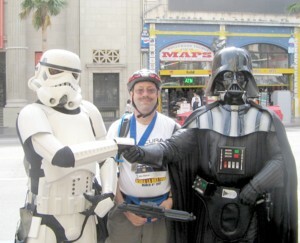 Look closely at where I'm pointing the Blaster. I didn't realize it until I got home, and saw the picture. 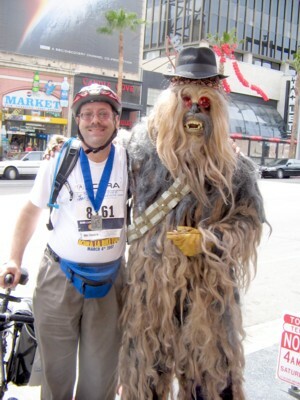 In a bit of masterful Intergalactic Diplomacy I got a Wookie to take the above photo. 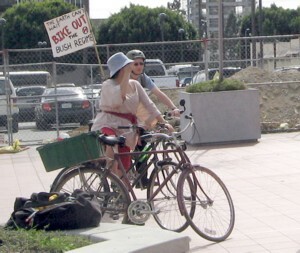 When I returned to the Metro Station, near Hollywood, and Vine, I encountered a staple of the Los Angeles Cycling Scene. 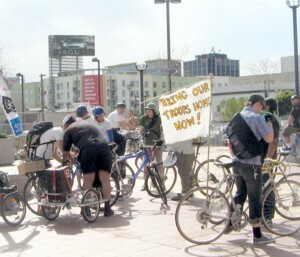 Critical Mass is the best known element of the Bike Protest Movement in LA, but hardly the only protestors around who use the Bicycle to spread their various messages. A small group of a dozen cyclists, 1 of whom wielded a Microphone, had staked out the corner of this busy intersection, across from the Pantages Theatre, for an hour in preperation for their little protest ride. The guy with the microphone rushed up upon seeing me, stuck the mike in my face, and asked me about the Dude.